AMCA Sidecar-Cross with my brother in the 80's. I am the passenger, although I raced solos I couldn't drive this thing for more than 10yds without veering off. I remember swapping places mid practice, trouble is we were on a cambered straight. As we roared along gradually running off the track, I pinned my brother undercover of the front shield as rope stakes went over the top like Exocet missiles. On ordering me out of the driving seat he demanded "why didn't you shut the throttle? ", my famous (within the family) reply was"cos it was good!". Again in right hand turns and tired, I found that I would be inclined to wedge by legs against the chair wheel arch whilst sitting on the bike behind my brother. This had the effect of transferring the high corner forces via my legs to the outside chair wheel and lift the driving wheel, much better to make sure I dropped myself over the seat well down on the right side of the bike and lift my legs clear. Borrowed KTM outfit, we did well on this, but I still love the Norton engine. The bike is a Norton Wasp, 920 ex Commando engine. At this time the big fourstrokes were dying out as the 500 two strokes became dominant. We generally finished mid pack. The video below is a scary example of a bad day and how problems can multiply. The entry to the spin is intended, the throttle is closed and the height is maintained by raising the nose and allowing the speed to decay until the wings lose lift and stall. The delicate straight ahead stall is deliberately upset at the very last stage, causing the aircraft to enter a spin. Normally the spin would be recovered to normal flight after 4 or 5 turns......not in this case, the nose is not in the expected low position causing the aircraft to spin in a more flat posture. Normally spin recovery procedure enables e planned exit at a nominated height......perhaps 2500 to 3000ft. I totally admire the composure of this pilot. When you hear him say "this is it" he is absolutely meaning the end. But he didn't give up, he saved his life and saved himself from serious injury. I think he just clipped a wire fence in the last moments. I'm sure the engine is VW based, although the failure is, I understand, to do with fuel problems due to the nature of the spin. I have just watched the "Brittown" DVD that my daughter gave me for Christmas. In my view, this is an excellent, inspirational documentary film. It rates for me along with On Any Sunday and Old Indians Never Die for just sitting and watching and escaping. It also makes me feel proud to be part of the motorcycle family. Although I guess the film is on a considerably lower budget than Any Sunday it still manages to deliver a visually fantastic representation of ordinary everyday (albeit talented) people enjoying the lifestyle and adventure of a slightly edgy, fringe, artisan and creative way of life. Nothing extreme here, but something many of us can relate to. The opening scenes and soundtrack had me sighing "well even if the remaining 70 minutes is junk, it's still been worth owning this DVD". Well the remaining 70 min were just as cool. If you are only in to modern efficient motorcycling then you may not see the appeal to this film. Otherwise I just can't recommend it enough. Thanks to Scott Di Lalla and Zack Coffman of "One World Studios" for giving what will become many "85 minute" injections of pure inspiration. I would like o wish everyone a very Happy Christmas, have a great day! 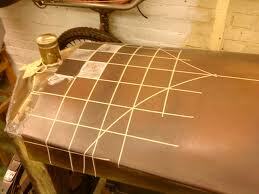 I like this picture, taken a few years ago, not in my workshop but a company that I subcontract for. Over the years and many workshops, I have always enjoyed looking back over my shoulder as I lock up to go home, somehow you often see the most atmospheric picture in the evening sun. This time I caught it, thanks to mobile phone cameras. 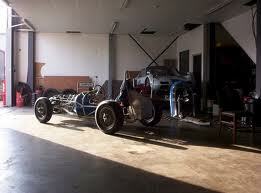 Over a number of years I have been working on an early 60's Sports Racing car similar to a Lotus 23. The car was owned and possibly partly created by an Antipodean driver who went on to considerable European success. Originally the car would probably have been fitted with a 1500cc Ford pre crossflow although it had a twin cam engine at the end of it's career. Evolution toward a powerful engine, increase in chassis loads through mechanical grip and weight increase have all given the flimsy chassis a hard life. The front section has some twist although historic repairs have aligned all of the critical suspension mountings. My intention is to keep the frame as original as possible, however the front had so many bronze weld repairs and distortion that I could not confidently leave this. The lower water tube/chassis tube has frost damage and grounding damage, I have added a second wall to this as something similar was in position to provide the floorpan location. The mid section of the chassis has a design flaw in that a loaded compression tube adjoins an unsupported upright tube. I have provided a pair of gussets to feed the loads progressively and doubled up with a new section of tube. I didn't want to rearrange this design as again it is part of the original design. I was hoping that we would fit a small engine for the chassis sake, if we do refit the Twin Cam then we will run with more period narrow "Wobbly Web" style wheels, this will reduce the cornering forces a little. 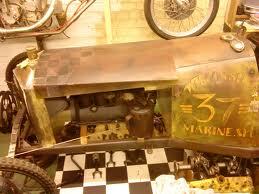 With the seaside air the blasted chassis is painted as I go. 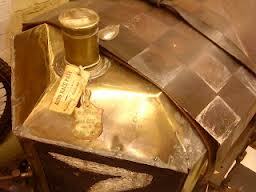 The following two Lagonda 2 Litres are early 30's or late 20's. I helped the owner to rebuild the car that is parked outside. 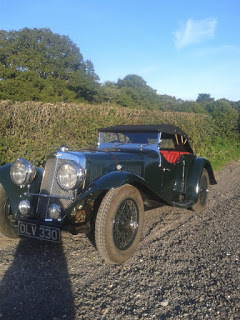 As owner of this car since attending the Imperial College in London as a student (he is now in his 70's), he is a very able and innovative engineer, constantly developing the car within the VSCC rules for circuit racing and hillclimbs. He will think nothing of transporting a bride to a Saturday wedding in the morning and then drive long distance to a circuit, strip lights and wings and scrutineer the night before the Sunday's racing. The Donkey exiting right is Freddie Jay! 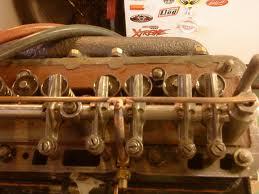 The second car required a fairly major engine rebuild, you can see the typical water jacket contamination of the block. 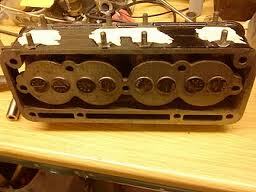 The cam arrangement is unusual, it has separate inlet and ex cams along the side of the block. It is tricky to remember when timing that the chain driven cams rotate opposite directions to each other. The port routes are quite surprisingly poor as they travel through 90 deg up into the head. There is an aftermarket head that provides a downdraft port arrangement. 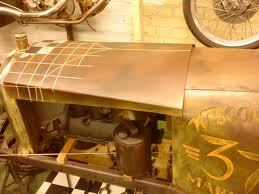 I may be wrong but I think that I recall W.O Bentley had a major input into this design. This was my first proper road bike. I bought it from near Cambridge and collected it in my then girlfriend's now wife's, 2CV (with the seats out). We rebuilt the engine and stripped and painted everything. 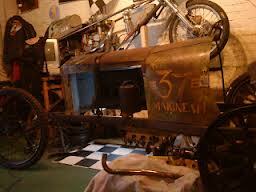 The hard tail was already in place on the original oil in frame front section. Forks are slightly extended and the rear wheel is 16". I repainted the tank British Racing Green with flames, more on these when I find the photos as they crazed overnight but, every cloud has a silver lining. We made the very minimal seat and my friend made the fantastic leather saddle bags and cover. She became my daily transport, although she did break the crank on the way home from work one evening. The amazing thing is that I pushed it the remaining 9 miles home! Even though I had RAC and a brother with a van.......Why did I do that?!!! I've tried to find it since selling in the early 90's but no luck. Although I ride through the year I avoid known ice conditions and certainly snow conditions. I was certainly caught out this time, Hungerford about 80 miles from home! A little while ago I made a hand change for this little Douglas. The owner sadly has a disability, limiting some of the use in his right leg. 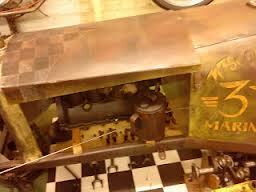 He is able to push the gear pedal down but unable to return it through the upward movement. 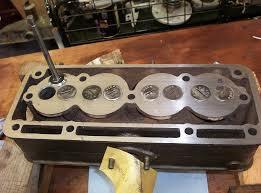 I have tried to keep the assembly as discrete and period as possible and made all of the fittings "clamp on" to allow the return to standard at any time. Such a beautiful and clean design. I don't know too much about this as it isn't an engine I have been involved in. Wish it was tho! My all time favourite engines are probably the American Miller creations. This engine shares quite a lot of design features with the Miller. Swanage Foxes Adapt to Snowfall !!! I made a little teardrop cover to use later on the front hood location bolt. Bit odd to make but just seemed a good idea at the time? 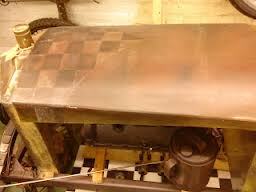 The chequered flag has been altered a little and have added a faint red pinstripe. 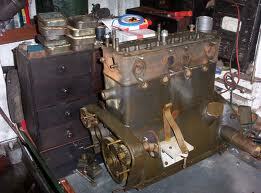 C I M E engine work this week consisted of some timing set up and trial fitting. The cylinder head water jacket is very open as can be seen. 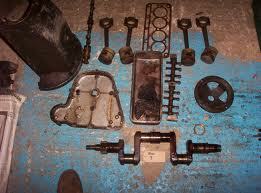 Rocker pedestals and rocker oil fed are all new modifications. Engine Shed, see thro broken window.